Artificial trees these days just keep getting better. We’ve seen the Treepod concept before, artificial trees that help clean the air. This time, artificial trees will generate electricity and collect fresh rainwater too! 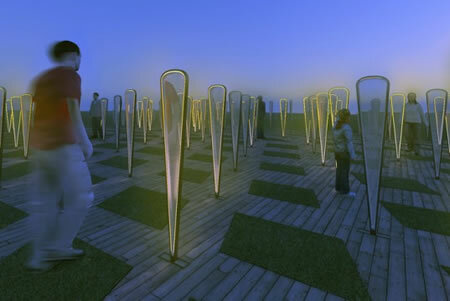 Designed by Anthony DiMari, these trees are meant to be placed in arrays, a little artificial forest of sorts and will make use of piezoelectricity to harvest energy. 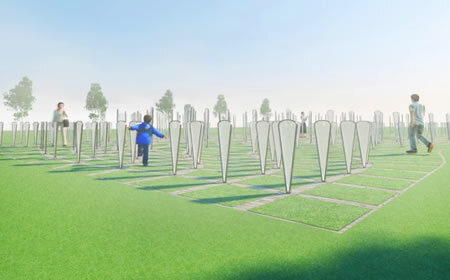 Called the Urban Field, the project will have the synthetic trees collect wind energy too. The energy collected will also be used to power on the LEDs that have these artificial trees glow bright at night. Carefully arranged to make maximum use of the winds blowing, the array of trees make use of natural resources to the fullest and work perfectly as sustainable decorations for parks and similar places, allowing visitors to experience a beautiful visual at night.